How did your career begin in the Civil Service and what was it like when you started? I joined the Department of Health (DH) in 1990 as a Grade 7, working in one of our offices at Elephant and Castle. My recollections of the job back then are of the physical space: long corridors, lots of individual rooms and people working silently on their own, behind half-opened doors. A good memory is that I took over my policy job from a colleague who had joined the department in 1948, the year the NHS was created. I’ve always valued that link to the start of the NHS. How did you feel when you first started in the Civil Service? Was it how you expected it to be? In the late 1980s, I had been working in the voluntary sector at a centre for people with AIDS and HIV. At the time, there was a lot of emotion and controversy about the condition. By contrast, the Civil Service culture felt very cerebral and, to be honest, I thought at times in the early days that I had taken a step backwards. However, I was lucky in my job – health policy for people with disabilities – and fortunate to work with great colleagues who gave me lots of support and encouragement. Early on, I got to go on visits with ministers and to work on policies that had a direct impact on people’s lives. It wasn’t long before I was then briefing senior officials to go before the Public Accounts Committee. Getting to work behind the scenes like that was very exciting. So, my initial impressions were soon dispelled by the opportunity to be part of government at work. When did you start thinking about a long-term career in the public sector? In secondary school, I had vague ideas about working in the public sector. Looking back I can see the influence of my parents. They had both come to this country in the 1950s and felt very strongly that we should give something back and make life better for the community. Why did you choose the Department of Health? When I was 28, I had meningitis. That was a bit of a turning point, because up until then, although I’d had a great education, I hadn’t settled on a career path and was changing my job every couple of years. As I recovered, it struck me that health would be a fantastic topic around which to focus a career – either in the NHS or the Civil Service. As it turned out, the path to DH wasn’t straightforward, because I ended up working in the voluntary sector first. Yet that proved to be the perfect bridge, as I had a good deal of interaction with DH civil servants. So, when I saw the advert for the Civil Service in my early 30s, it seemed an ideal next step. On a practical level, I also wanted to be with an employer where I could change roles, get training opportunities and move around without having to change my employment status – and the Civil Service has certainly proved to be a great place from that perspective. Over ten years, I’ve had ten different jobs in five different organisations, all as a civil servant. What has been the biggest change to the Civil Service you’ve seen in your career? I’d pick two – technology and transparency. When I started we had computers but not emails! I remember the first emails were internal, between our offices in Leeds and London in 1992. Technology has advanced hugely since then and enables us to do so much more and in an ‘agile’ way. Fixed-term project teams are now almost the norm, whereas before we were ‘looking after’ subject areas, whether or not there was a lot to do. Secondly, modern government and the modern NHS are much more open, and the digital revolution has certainly helped. The website ‘My NHS’ is a fantastic resource for the public, even giving comparative data at a scale unthinkable in the past. What is it like to work in challenging policy areas? Fun, energising and sometimes exasperating – yet always fulfilling, because you know you’re working on something that matters to people. What’s the most exciting project you have been involved with in the Civil Service? As part of DH’s ‘100,000 Genomes’ project, we have set up a company – wholly owned by the Government – to sequence 100,000 human genomes. The aim is to build a digital library, from around 70,000 patients who have agreed to be part of the programme. In the future, it can be used by academics and clinical scientists to progress research into the causes of cancer and rare diseases, leading to the development of new and more effective treatments. DH runs a two-week internship programme for Year 9 pupils from schools in South London. We give them a chance to see behind the scenes of the Civil Service and to get to know the sort of work we do. I meet the students at the beginning and the end of the fortnight. And speaking to them again when they’ve completed their internship at DH is the most inspiring day of my year, because they are so positive about the experience. What was the biggest challenge you’ve faced in your career in the Civil Service and how did you overcome it? For nine years in the middle of my career, I was out on different secondments. During that time, it was a challenge to keep in touch with what was happening in government. I overcame this by maintaining my friendships with colleagues and taking as many opportunities as I could to stay informed with what was happening on the national scene. Thanks must go to the excellent people in DH’s HR department who helped me to gain these experiences. What’s one of the most important things you’ve learnt from an organisation external to the Civil Service? When I worked at a University College Hospital for four years, I saw for myself that the people who provide frontline services every day have the most difficult jobs in the public sector. I also learnt that, because of this experience, they invariably have innovative ideas and solutions to the problems we face. So I am a big believer in joint working between the Civil Service and frontline professionals, and in encouraging civil servants – who work in policy – to get out of their offices and learn about real-world problems and service delivery. One – do the job you’ve got as well as you possibly can. Two – take every opportunity to improve your skills. Change is only going to intensify in government departments, and doing these two things will put you in control in a fast-changing environment. What advice do you have for women who are aspiring to be senior civil servants? It’s very important that women step up and do challenging and unpopular jobs, because that’s how you will get noticed and gain the experience you need to thrive in the Senior Civil Service (SCS). Senior jobs are complex and you need a breadth of experience to do them well. I know that it’s not easy for men or women, particularly if you have caring responsibilities. It is also the job of the organisation to make it possible for people with these responsibilities to do these jobs. In DH, I have been very determined to create new job-sharing opportunities so that people with reduced hours can do those roles. What makes an effective civil servant? Courtesy and respect for other people is really at the centre of it. Our work involves operating in teams, influencing people and completing tasks through others when we don’t have the capability ourselves. Interpersonal skills and the ability to listen and treat everybody with the same level of respect is an essential component of being an effective civil servant. Take an interest in what’s going on around you. The Civil Service is about the administration of contemporary life, but it’s also about preparing the country for the future. Taking a broad interest in what’s going on currently, the risks and challenges for society and what the future holds is a good orientation to build a Civil Service career. What are some of the major highlights of your career? I have done incredible things. I spent two years in Private Office – one year in DH and one year working for the Secretary of State for Transport. I went on a very interesting visit to Japan and South Korea with the minister, where we were looking for investors in the UK transport infrastructure. I’ve also been in a 747 simulator in the United Airlines US HQ. And I even visited several prisons when I was working in the Cabinet Office efficiency unit and we were overseeing the prison service. I am going to have a long holiday and then spend time over the summer exploring opportunities where I can contribute and have an impact on society. Whatever happens, I will continue to be a friend of the Civil Service from the outside. It is quite an exciting time for me. I want to use my time well. 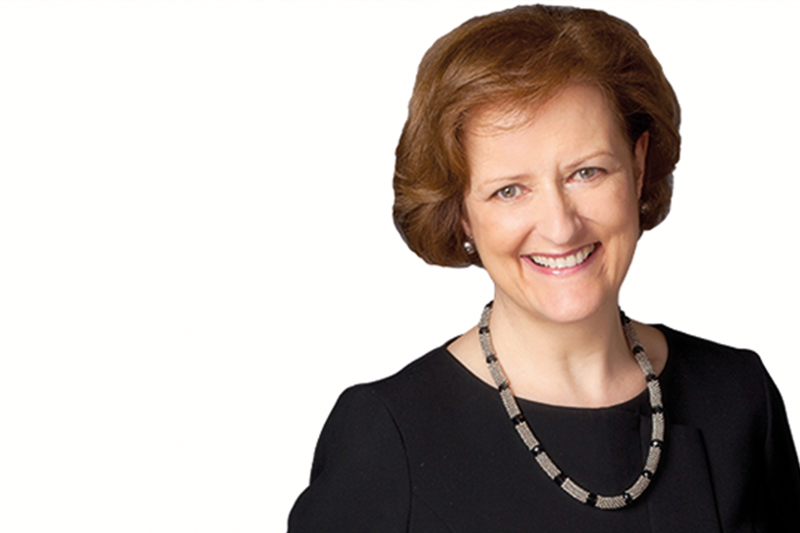 Dame Una O’Brien was the first woman to be appointed Permanent Secretary at the Department of Health in 2010, and has over 20 years of experience in leading and managing major change in health policy. She graduated in Modern History from St Anne’s College, Oxford University, and went on to work as a researcher at the University of London. In the 1980s, Dame Una played a critical role in establishing London Lighthouse – a pioneering third-sector provider of services for people with HIV and AIDS. She was Champion of the Civil Service Awards and Chair of the Civil Service Board, the Department of Health Board and the Civil Service Talent Board.